Smooth. Rich. And a touch of sweetness. These are some of the traits you will find in a well-made rum. And Appleton Estates is the essence of quality when it comes to these characteristics. My husband and I recently traveled to Jamaica, and for us, no trip to Jamaica is complete without a tour of the Appleton Distillery...and bottle purchases! Our tour began with a scenic drive through the mountain roads; if you want a true Jamaican thrill ride, this is a must! Narrow roads twisting and winding up and across the mountainous island terrain, all with oncoming traffic that you may come across at every turn! Once we arrived, we were greeted at the tour meeting area with a refreshing glass of rum punch, which surprisingly settled my stomach from the drive! Appleton rum begins in the sugarcane fields. When the canes are harvested in Spring, they are brought to the plant and ground down mechanically to extract the sweet juice inside. 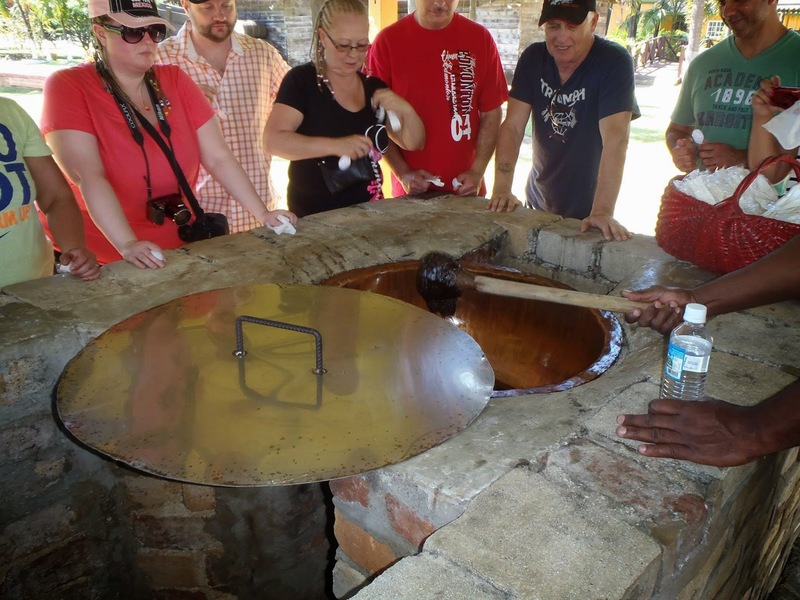 The cane juice is cooked down to cane syrup, then cooked even further down into molasses in copper pots (We were able to sample this molasses on the tour, and it was so pure and sweet that I could eat it all day!). The crystalline sugar is removed, leaving behind the molasses which is used for the fermentation process. Water and a natural yeast culture, exclusive to Appleton, are added to the molasses and allowed to ferment. This creates a "wash", composed of 15-18% alcohol. The wash is then put through the distillation process, which occurs in Appleton's classic copper pot stills, or in a higher capacity column still. Pot stills are used for the minority of production; column stills are used for the majority. Each harvest's production run, whether from pot or column stills, are then barreled and sent to the aging warehouses. These consist of cask buildings filled with oak barrels. Each barrel is labelled by date and production run. Appleton's premium rums are aged from 8 years to 30 years, and the minimum age for the blend of rums is guaranteed and stated on each bottle. Once the rums have aged their required amount of years, it's up to Master Blender Joy Spence to create the perfect house style that has set Appleton apart from their competitors for decades. With over 25 years of experience in rum blending and 16 as part of the Appleton family, she ensures the house style and quality are consistent each year, blending by hand. Appleton is also extremely diligent with their carbon footprint. All of the sugarcane grounds from pressing are returned to the fields. The moisture from the mud on the stalks is removed and used as compost. They have also installed an emissions-free boiler, which releases only water vapor and no ash. Nothing is wasted at the distillery. My personal favourite in the tasting was the Sangster's rum cream (chocolate flavoured! ), pictured 2nd from the left. It is fantastic with coffee! And there is always a soft spot in my heart for the V/X, pictured on the far right, which is a staple on our bar at home. We ended up bringing home bottles of the Reserve and 12 Year Old Extra rums (click here for their product list), which are not part of the tasting, but sell for a great price on site. 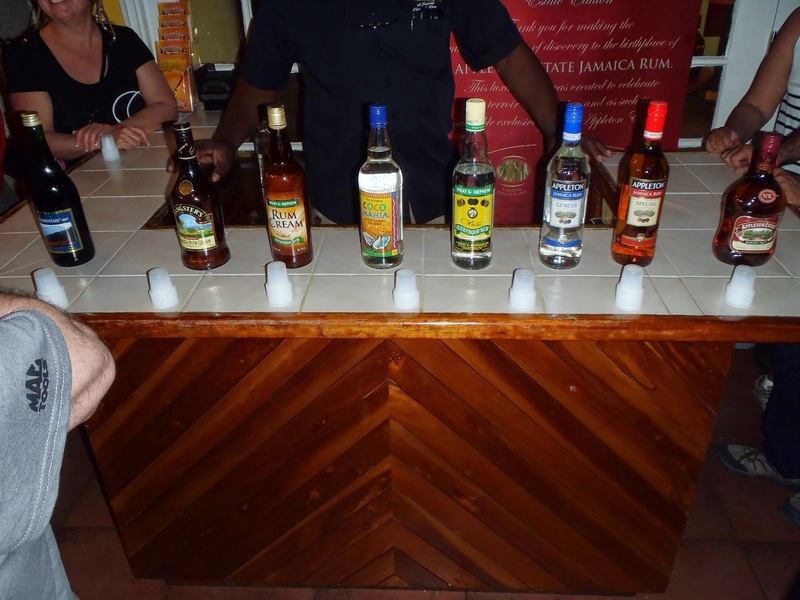 The next time you're in Jamaica, it is definitely worth checking out the Distillery Tour. 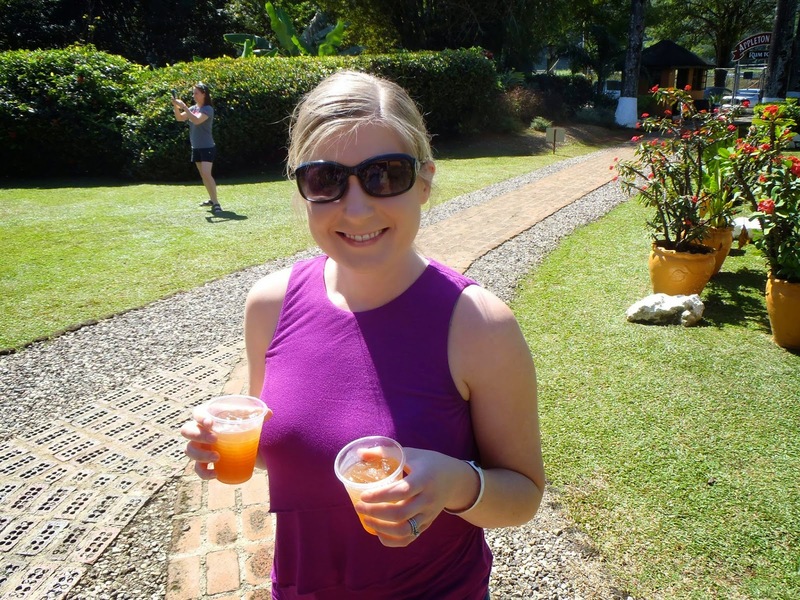 The guides are all friendly and extremely knowledgeable, the tour is thorough and interactive, and the rum punch a tasty must-have! All of this on top of access to some of the finest and highest quality rum produced in the world. You will leave feeling "Irie" - I promise!